The Triumph TR7 and TR8 were produced from 1975 to 1981 at 3 different factories starting with Speke from 1975 to May 1978, then to Canley from October 1978 to August 1980, and ending at Solihul. A V8 powered version of the TR7 was planned from the start but with the financial issues and labor problems at British Leyland, MG and Range Rover were priority for engines and delayed the TR8. 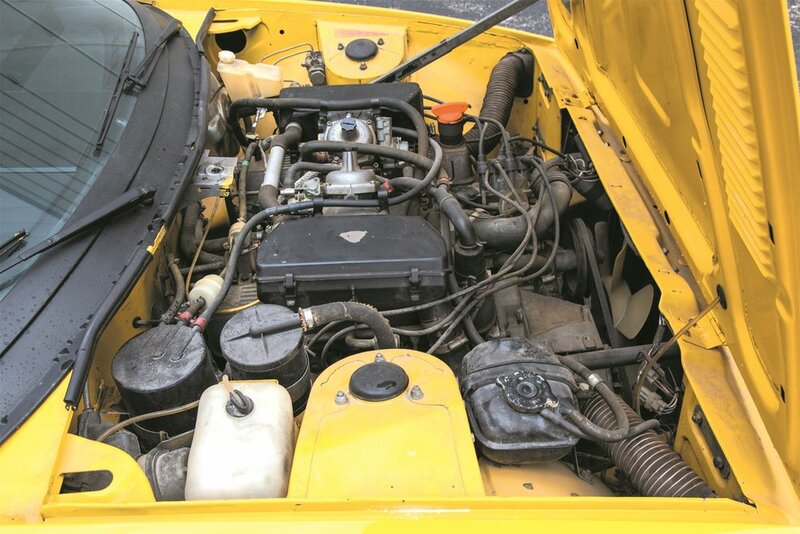 Triumph did not choose their own overweight and unreliable engine in the TR8 as used in the Stag, instead they used the 3.5 liter Rover V8 based on an all-aluminum 215 cubic inch Oldsmobile/Buick engine sourced from GM in the 60’s. As used in the TR8 the engine was rated at 133 bhp around 5,000 rpm and was good for 0-60 mph times in the low 8 second range. Because of its good performance the TR8 was sometimes referred to as the English Corvette. While official BL production figures vary, records indicate that of the roughly 2,750 TR8s produced starting as early as 1978, only about 400 coupes were made. Built in 1979 at Canley with a TCN prefix chassis number most sources would call this car a pre-production model. This Inca Yellow car with black interior features an automatic transmission and dual 175CD Stromberg carbs.